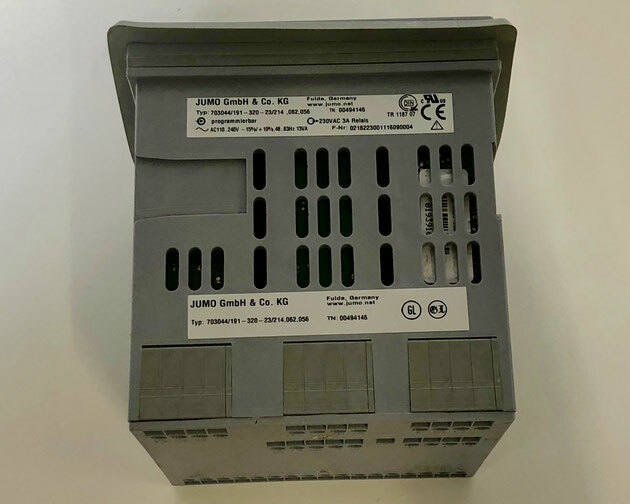 If you would like to receive an offer for a JUMO electric controller or another item, then please email directly at sales@shipspares.nl or use the "REQUEST A QUOTATION" - FORM. 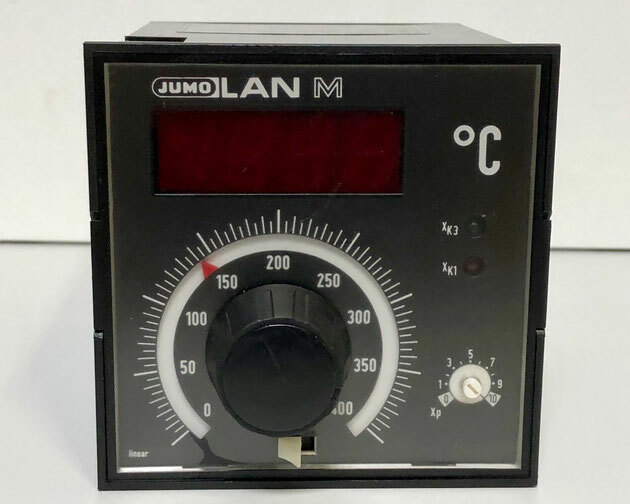 The JUMO LAN M electric controller, Type: MRDW-96/DI,D,RE6,LK46, Fb.Nr. : 930427271793. This controller has an input of 0…449,9℃, PT100. The controller works on 1U 220V and 2U 110V, 0T50 and 50Hz. 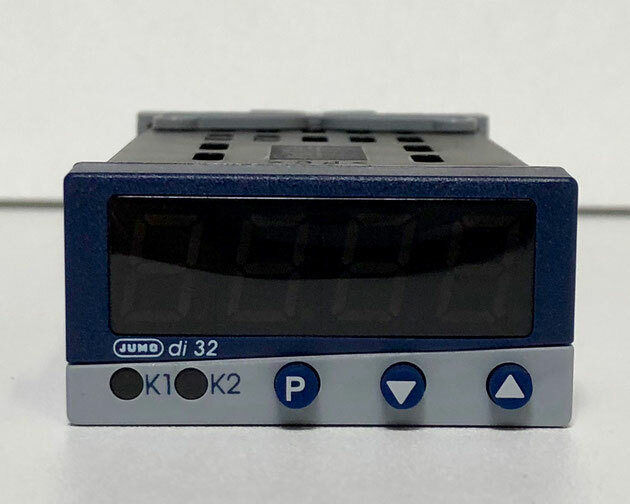 The display of the controller offers a digital display for the ℃ and LEDs to indicate ˣK1, ˣK2, ˣK3 and ˣK4. It also contains a counter with buttons to adjust the parameters. 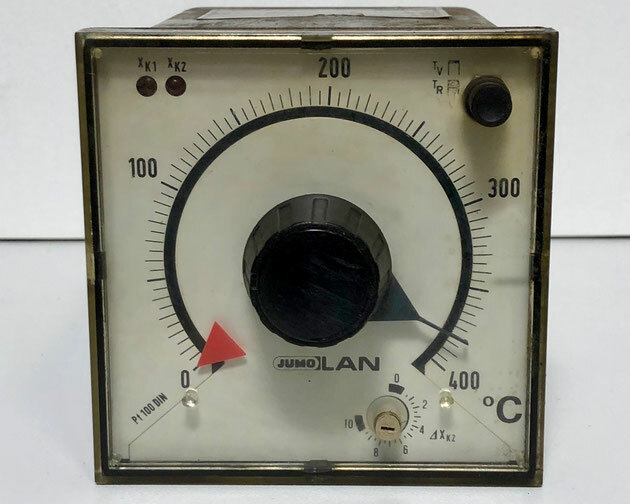 The JUMO LAN M electric controller, Type: MROw-96 / di, 2, Fb.Nr. : 85043316. 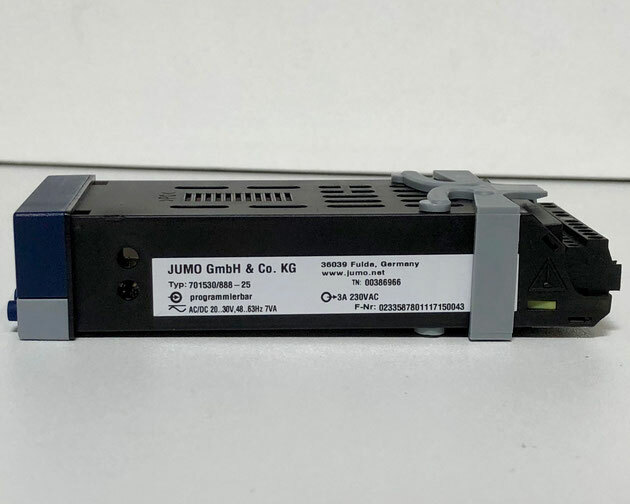 The JUMO MRO.-96 is an electronic, single-point controller with digital process display and digital setpoint adjustment. This w-type is for connection to resistance thermometers in three-wire circuits. The input of this controller is 0 + 400 ℃. Pt100 and the output is 5A/22V. 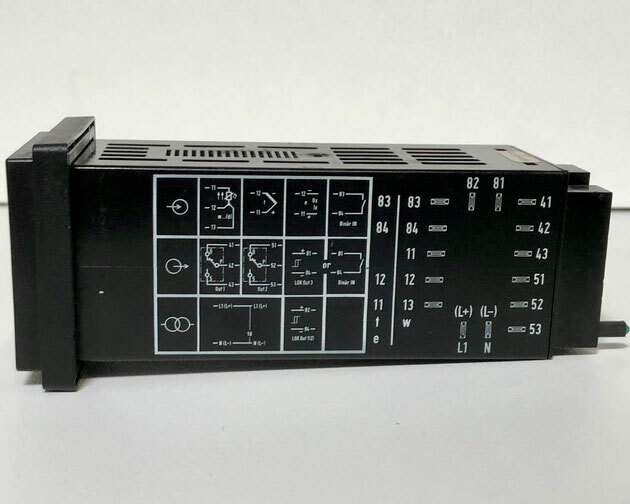 This controller works on 1U 220V, 0T60, 50/60Hz and 3VA. The display shows the temperature in ℃ and has a button to adjust the temperature. LEDs indicate if ˣK3 or ˣK1 is active. 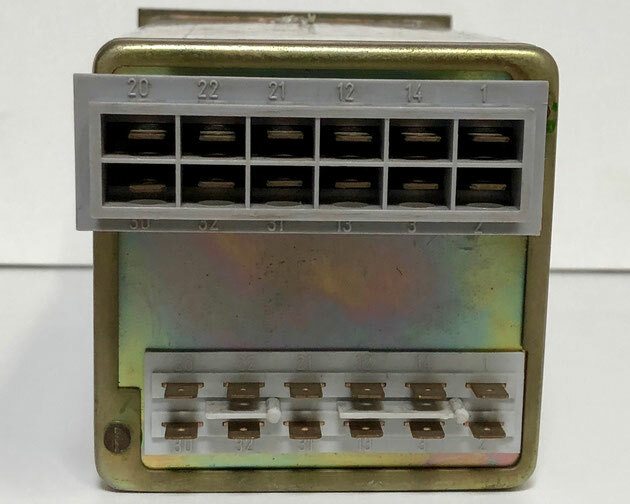 The JUMO LAN electric controller, Type: QRVw-96 / 2,1a,ds,aka,DIN, Fb.Nr. : 81403633. The controller has an input of 1100 W and works on 220V, 40/60Hz, 3VA. 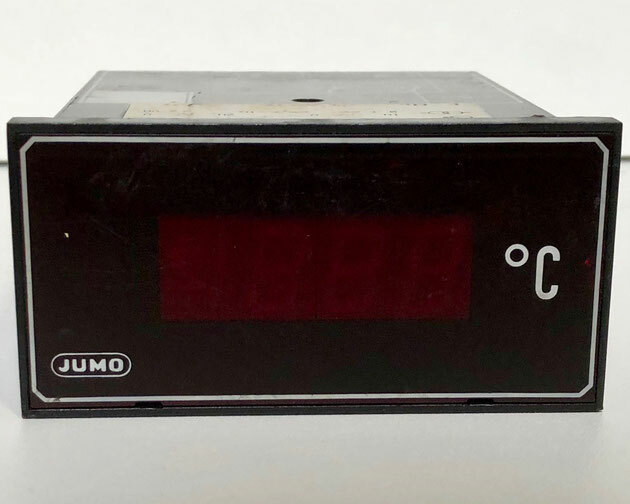 The display shows an analogue temperature display and a button to adjust the parameter. 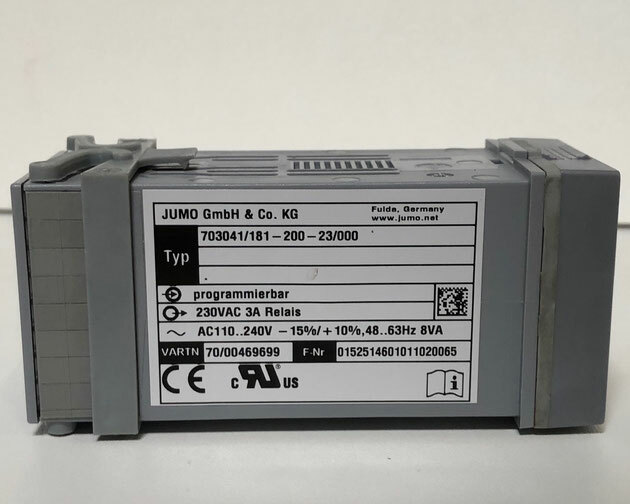 The JUMO electric controller, Type: GRDw-96 / 0, 2, dl, re5k, ws1. 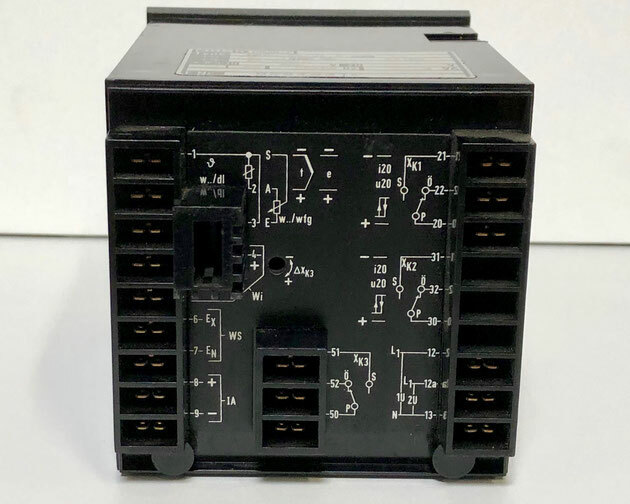 This electric controller has an input of 5A or 220V. The display of the controller has a button to adjust the parameters and a display to show the temperature. 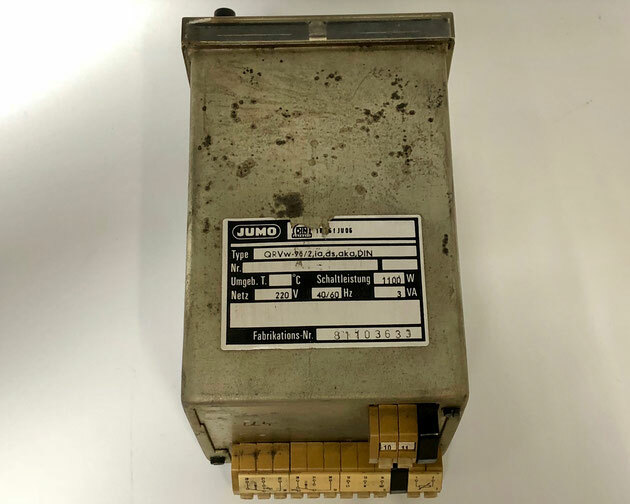 The JUMO DICON S electric controller, Type: SR-96 / 4-001.2.1.21-111-11, Fb.Nr. : 9304902022097016581. The VDN-Nr is E045.01.83 and the software version is 024.05.12. The ME1 input is 0 + 300℃, Pt100. The ME2 input is 0 + 300℃, Pt100. The ME3 input is 0 + 100%, WFG. 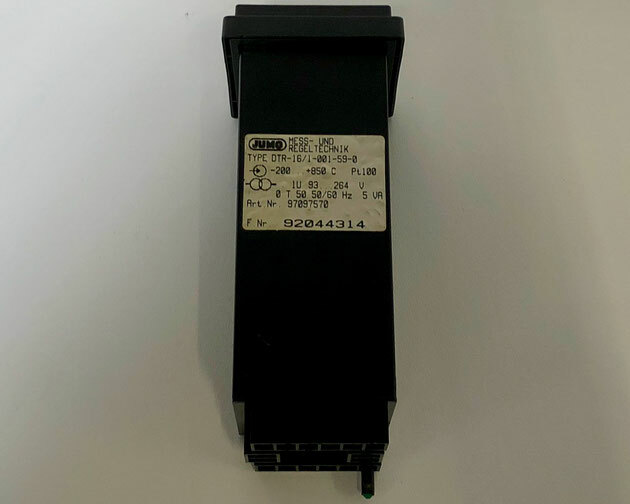 The ME4 input is 0 + 300℃, 0-20mA. The A1 output is 660W/3A, 20/21, 0 + 300℃, 0-20mA, 5/6. The A2 output is 660W/3A, 30/31, 27/28. The A3 output is 660W/3A, 40/41. 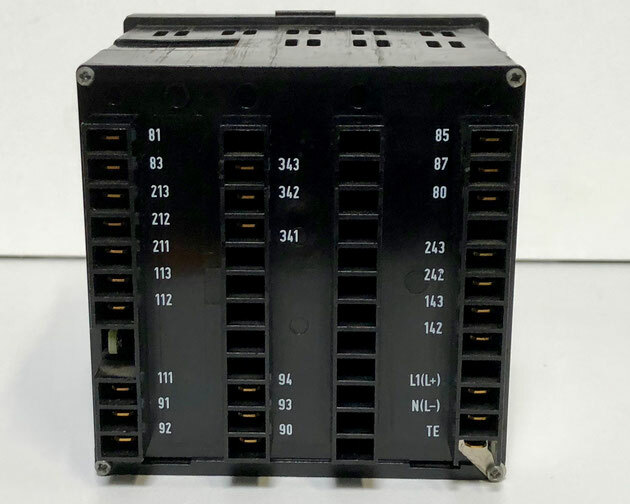 This controller works on 230V, 40…60Hz, 0T50 and 15VA. 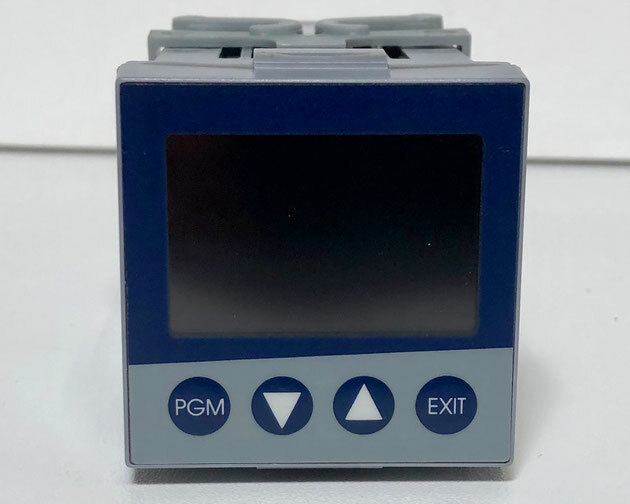 The display has a digital screen for the temperature and buttons to adjust the parameters of this temperature controller. 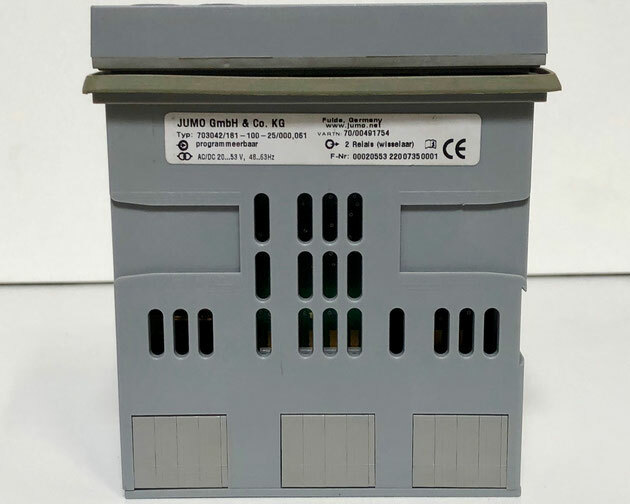 The JUMO dTRON 04.1 electric controller, Type: 703030 / 40-001-000-00-101-01 / 000 -, Fb.Nr. : 1849803022099491807. 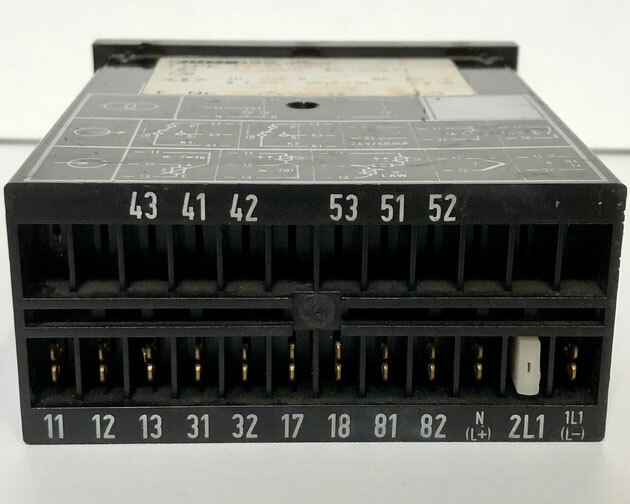 This is a microprocessor triple-point controller, with a Pt100 The input is 0…+200 ℃, Pt100 input and relais output. The output is 3A.250VAC-0ohm.Last. This controller works on 48…63Hz .93…263V. 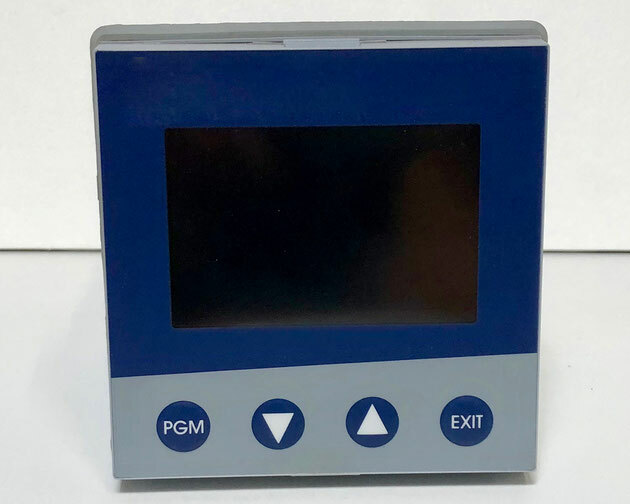 The display contains a 7-segement red and a 7-segment green display to display the value of the measurement tools that are attached to the inputs. The display also shows LEDs to indicate when a gradient function is active. The display contains various buttons to adjust the parameters. 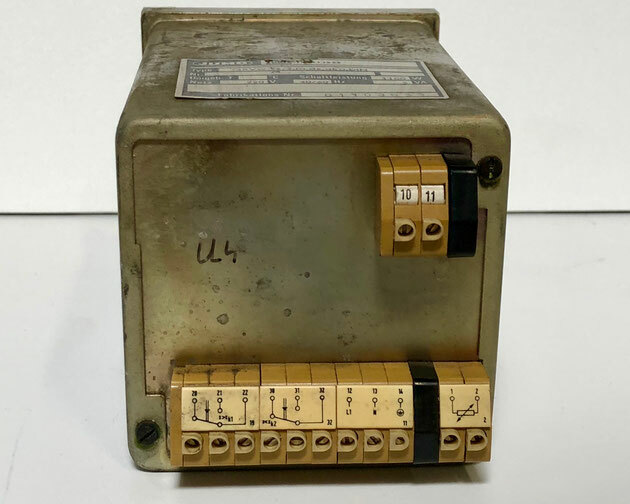 The JUMO electric controller, Type: PDAt-48m, Fb.Nr. : 940330441394. 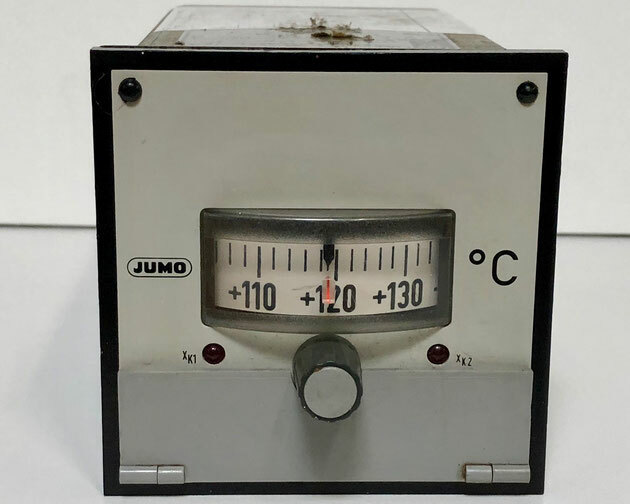 This temperature controller of JUMO has an input of 0-900℃, Fe-CuN. The controller works on 1U 220V and 2U 110V, 0T55, 50/60Hz, <7 VA. This controller has a single segmented temperature in ℃ display. 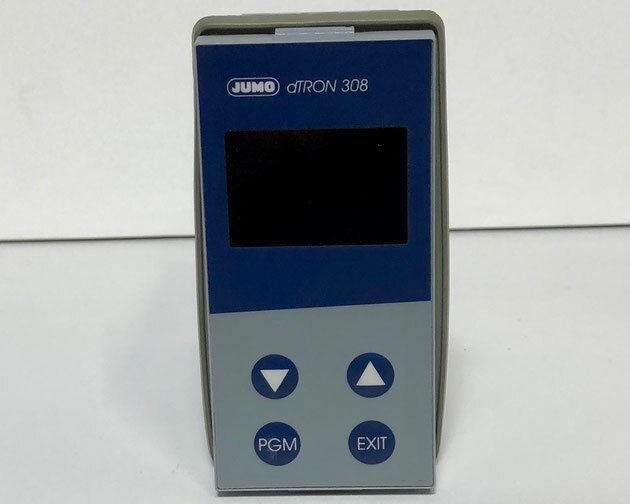 The JUMO dTRON 308 electric controller, Type: 703042 / 181-100-25 / 000,061, Fb.Nr. : 0002055322007350001, VARTN: 70/00491754. 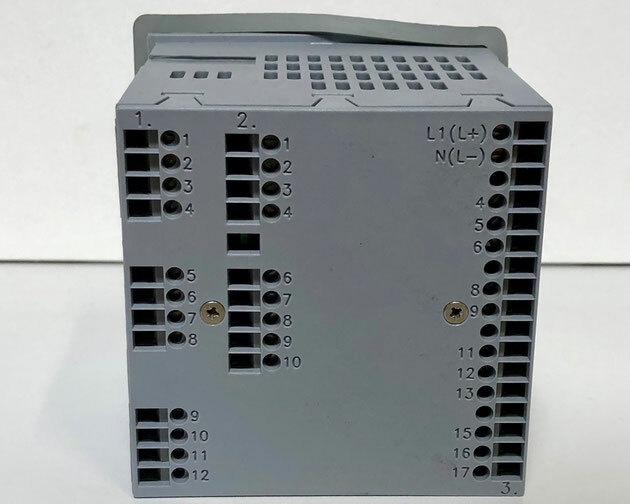 This controller has a dimension of 48mm x 96mm and contains one analog and two binary inputs and 2 logic outputs. 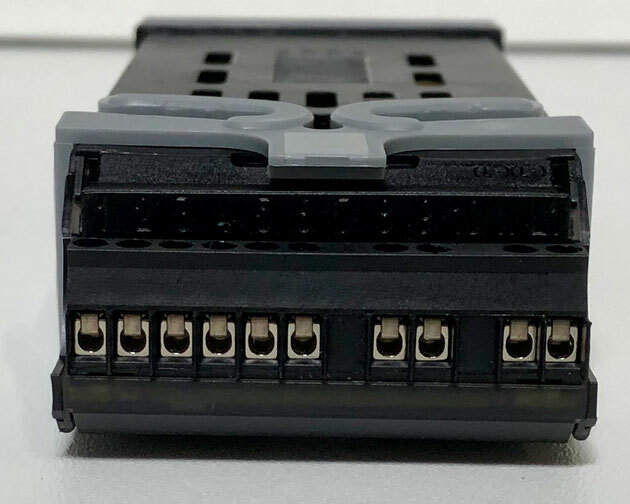 The input of this controller is programmable and the output is 2 (exchangable) relais. This controller works on AC/DC 20…53V, 48…63Hz. The display contains a 7-segment display that shows the process value, or another value if you adjust the factory settings, a display that shows which setpoint is active, a 7-segment display that shows the setpoint, or another value if you adjust the factory settings, a indication of the binary inputs and which program is active and a 16-segment display for the temperature and text.. The display also contains various keys to adjust the parameters of the controller. 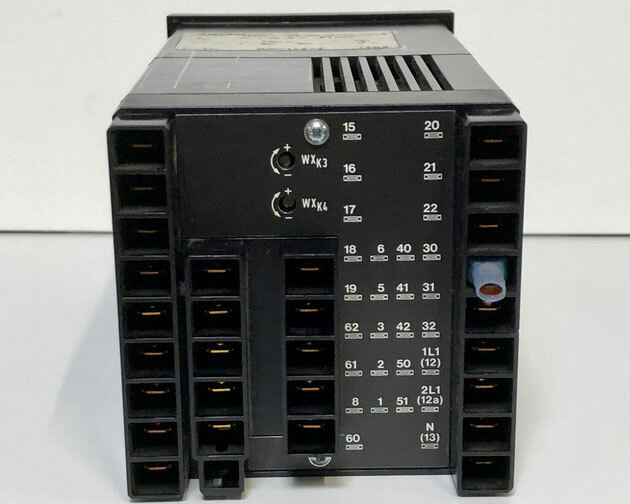 The JUMO dTRON 316 electric controller, Type: 703041/ 181-200-23/000, Fb.Nr. : 0152514601011020065, VARTN: 70/00469699. 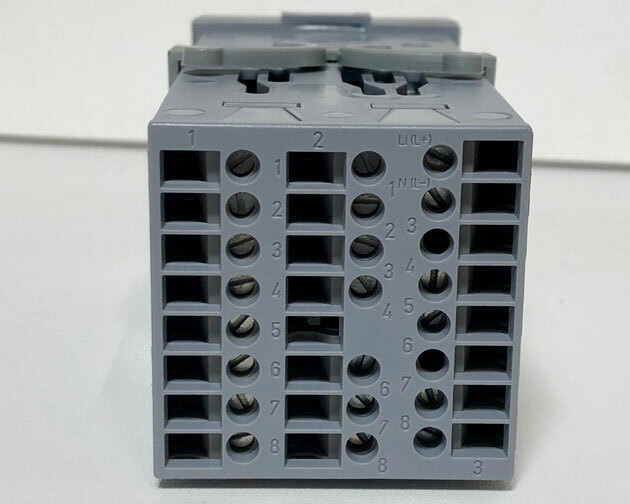 This controller has a dimension of 48mm x 48mm. The dTRON 316 has one analoge input, two relay outputs and two logic inputs or two logic outputs. 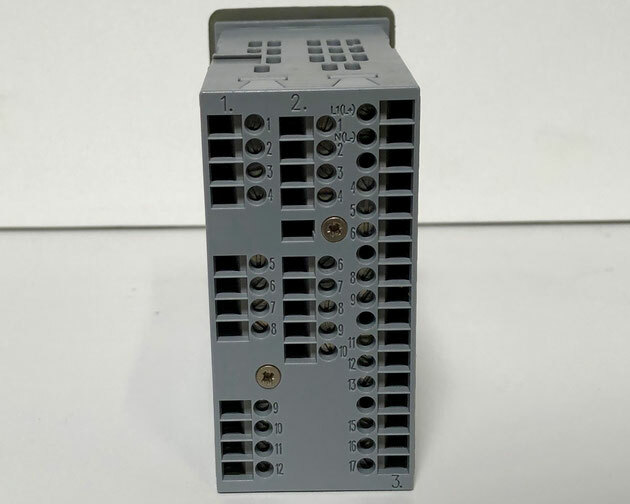 The inputs are programmable and the output is 230VAC, 3A relais. The controller works on AC110…240V - 15%/ + 10%, 48…63HZ, 8VA. The display shows a 7-segment display that shows the process value or another programmed value, it shows the active setpoint, it shows the setpoint or another value in another 7-segement display, it indicates the status of the logic outputs, and the function and type of operation that is active, and it has a 16-segemented display for the temperature and text. The controller display also has keys to adjust the parameters of the controller. 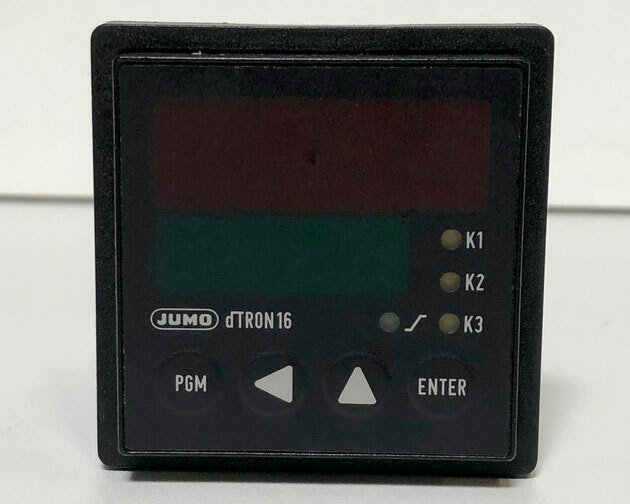 The JUMO dTRON 16 electric controller, Type: DTR-16 / 1-001-59-0, Fb.Nr. : 92044314, Art.Nr. : 97097570. 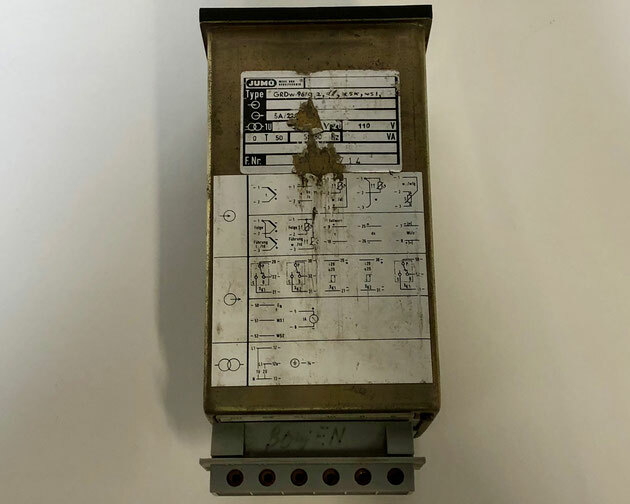 This is a single-setpoint controller with a maximum contact of which the feedback structure can be configured. 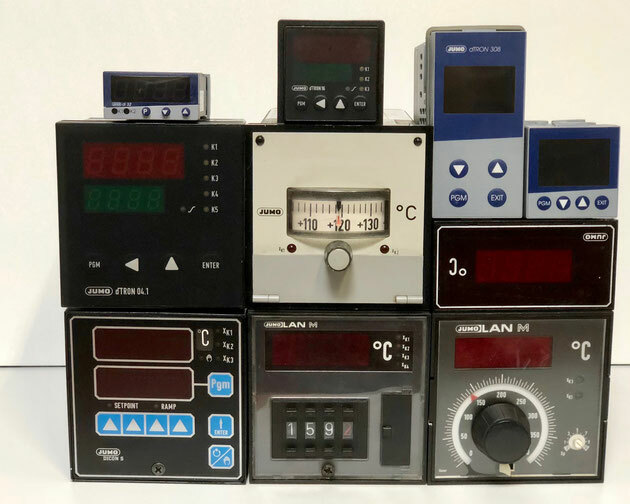 It has a resistance thermometer in 3-wire circuit with a Pt100 that has a range from -200 + 850℃ signal input. 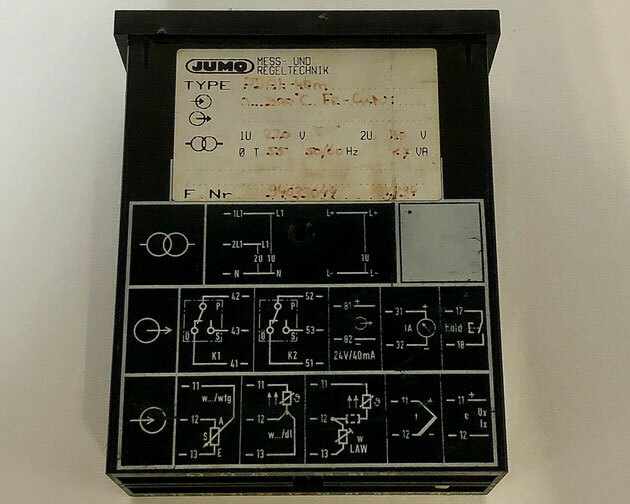 The relay output 2 can be programmed. The display shows a r-digit process display, a 4-digit setpoint display, keys to adjust the parameters, a LED for the ramp function, and LEDs to indicate the status of the outputs. 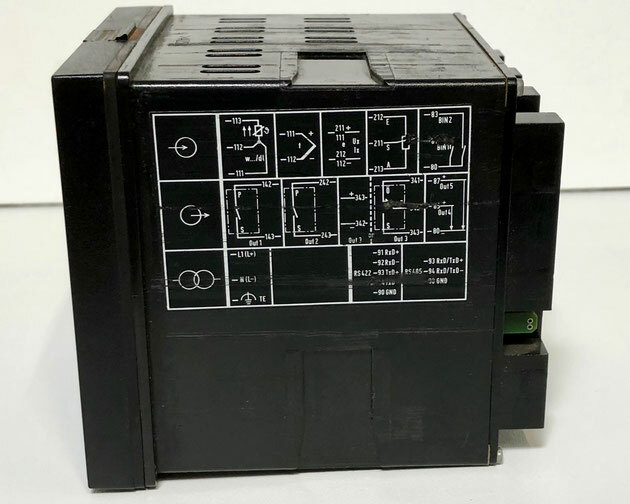 The JUMO dTRON 304 electric controller, Type: 703044 / 191-320-23/214 .062,056, Fb.Nr. : 0218223001116090004, TN: 00494146. 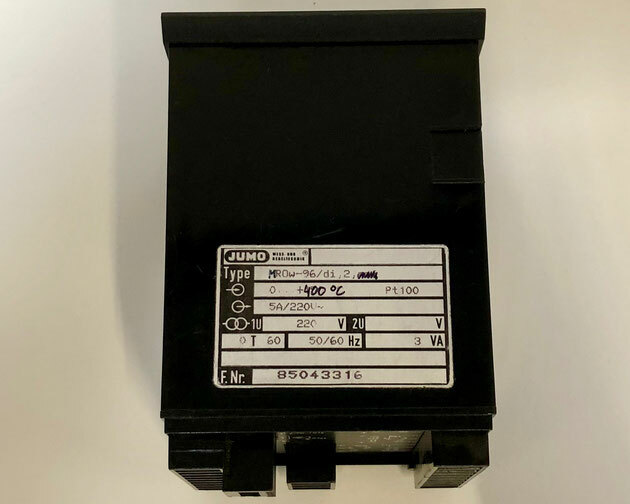 This dTRON 304 has a dimension of 96mm x 96mm and has one analog and two logic inputs and two relays and two logic outputs. This controller is programmed to the customers specifications. 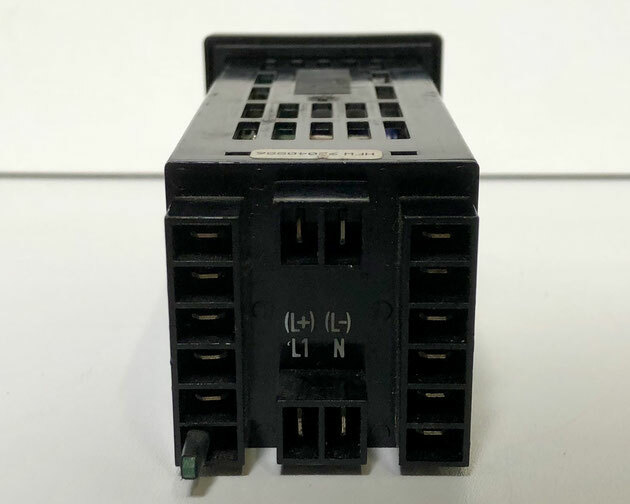 This specific controller has been configured to have a math and logic module and is build according to DIN EN 14597 approval. The screen shows a 7-segement display, an indication of the active setpoint, another 7-segement display, indicators for the status of outputs and the type of program and operation that is activated, a 16-segment display for the temperature unit and text and keys to adjust the settings of the controller. 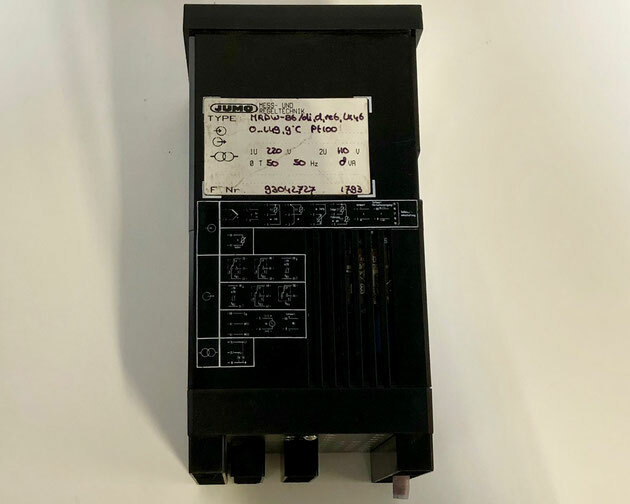 The JUMO di32 electric controller, Type: 701530/888-25, Fb.Nr. : 0233587801117150043, TN: 00386966. 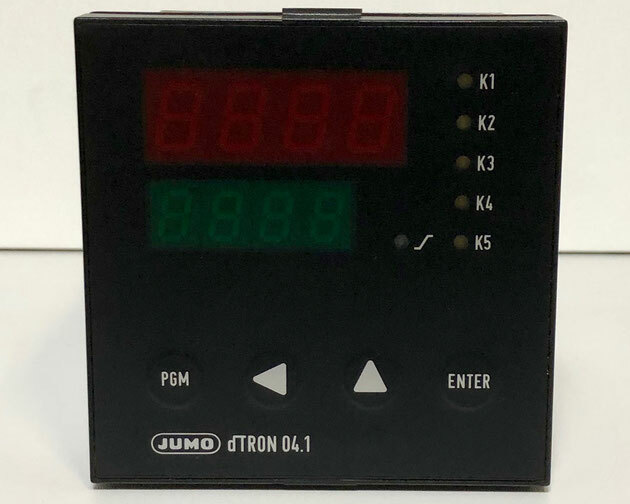 This JUMO controller is a digital indicator with a dimension of 48mm x 24 mm. 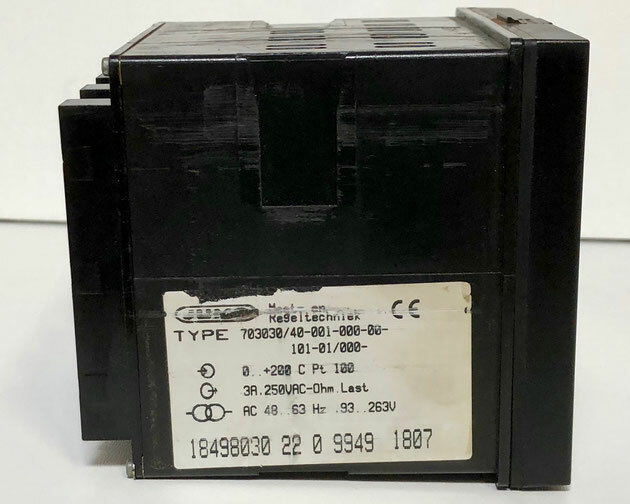 The input of this controller is programmable and the output is 3A/230V AC. The controller works on AC/DC 20…30V, 48…63Hz, 7VA. 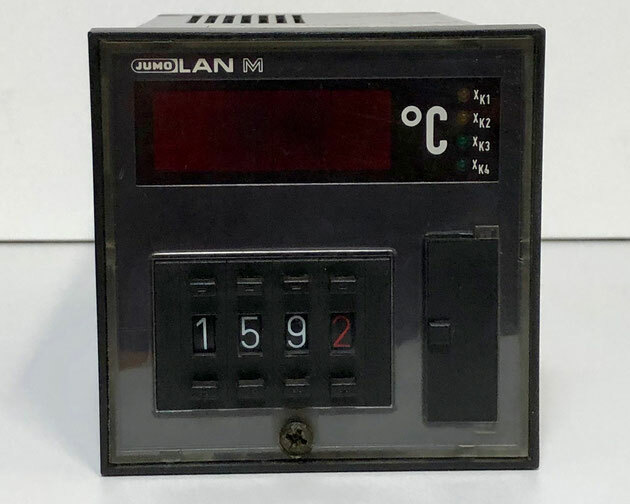 The display shows a 7-segment display for 4 digits to show the temperature, LED status indicators for outputs 1 and 2 and buttons to adjust the parameters.